Every house would need proper lighting. Without it, it would look gloomy and the dwellers won’t be able to do function well. This too is applicable for the outdoor area. 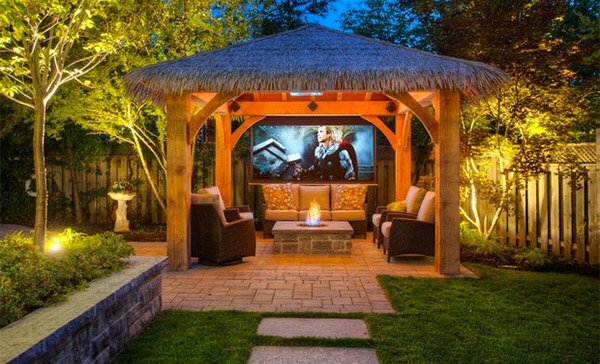 It would be better to add lights outdoors so that you could do different activities while you are outside. 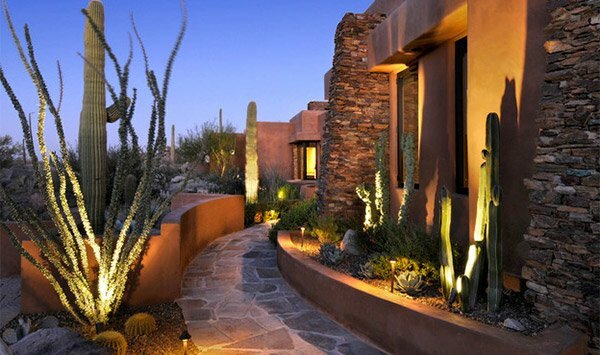 Also a well-lighted outdoor space could give your landscape more beauty during the night. There are different ways a landscape could be lighted. 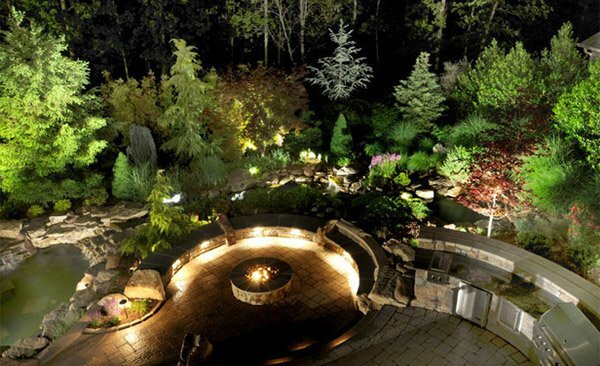 So, today we are going to show to you some landscaping that had lovely lights in them. 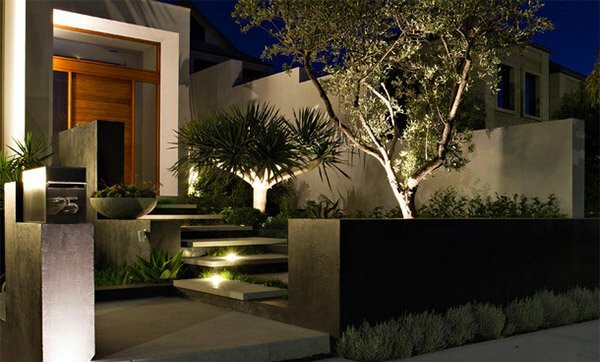 Check them out so you can get ideas on what you can do with your own home’s landscape lights. Lines and extensive details are featured in this contemporary landscape. LED lighting under the floating steps made the garden totally stunning. 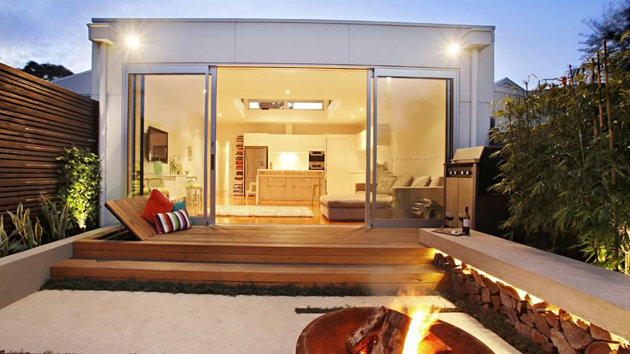 A contemporary modern home used lights not just for the pergola but also in the floor. You can also notice the lighting on the far end for the water feature. Concrete pavers that appeared like slate was used for flooring. It used exterior swivel spots, task lighting for the grill area and vertical lighting that made it look more beautiful. Tree up lighting placed on the planters looks really gorgeous. Even the light coming from the inside and from the pool summed up a stunning look. Underlit benches seem to beckon people to gather around the fire. Such a lovely design! 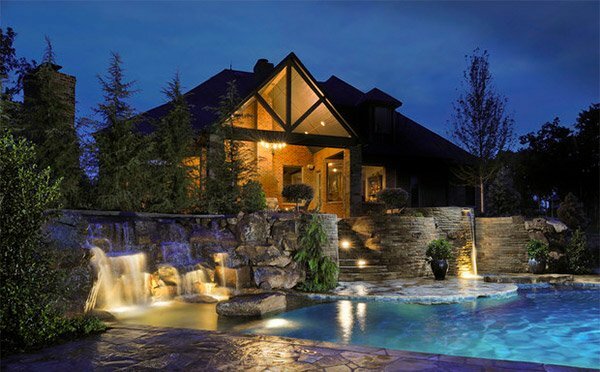 Wall lightings make this house appear like a shining jewel even from a distance. You can notice the lights that were installed on the eaves of the roof which added a dramatic look to the outdoor scene. The lights coming from the planters illuminated the trees and plants in it. A garden water feature looked very lovely with rope lighting on it. Using rope lighting is a good idea because these are durable especially that they are encased on plastic. 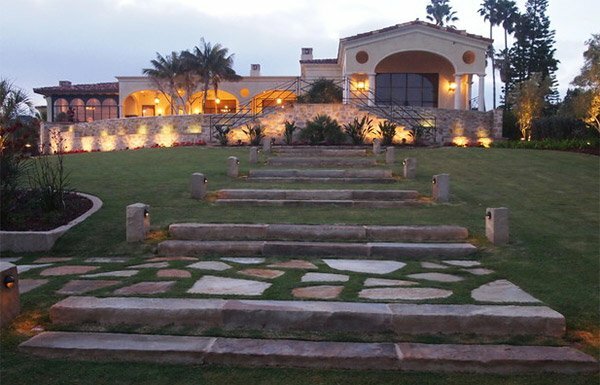 A well-lighted walkway which can also be a good spot if one merely wants to relax and take a good look of the beautiful surroundings. This outdoor living space has a great mood for relaxation. The lights around it add to that mood including the fire pit at the center. 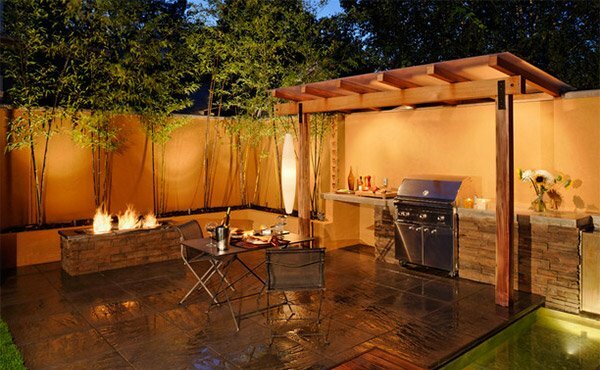 A creative idea for an outdoor space is the use of lanterns like what you see in the picture. 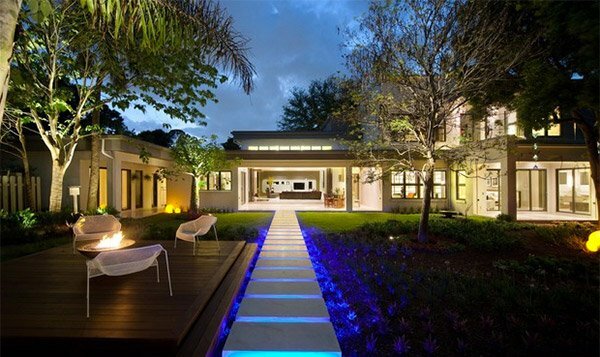 In this modern home, you can clearly see the step lights and up lights which are a good way to light the outdoors. 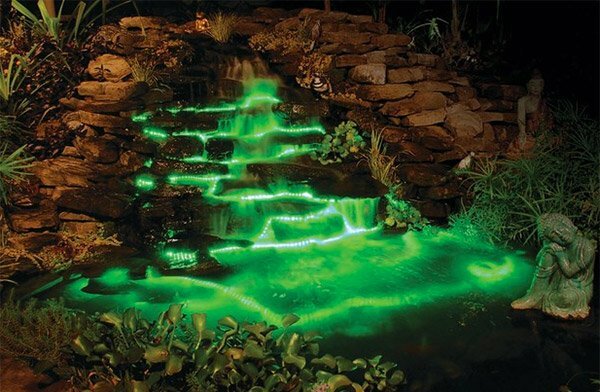 The lighted rocks in the waterfalls created a dramatic scenario. The distribution of light in the area is also good. The fireplace brings beauty to the higher level but the lights on the pathways and the up lighting are also totally cool. 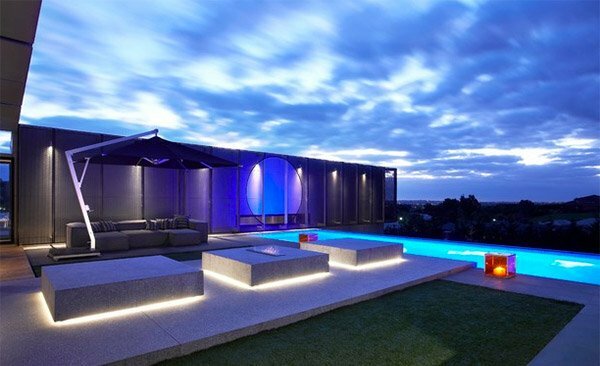 The concrete blocks look like floating elements in this modern outdoor space because of the use of under lightings. 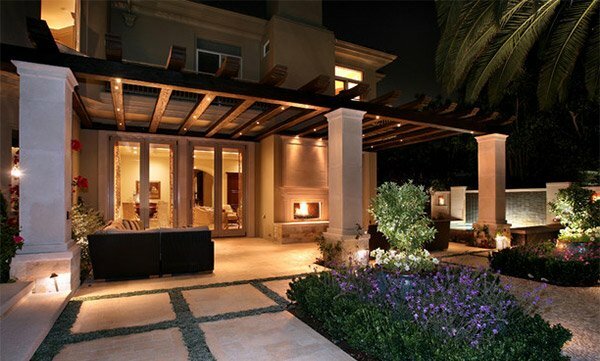 Anyone would certainly love to have lighted outdoor spaces like the ones above. It could give your landscape a lovely appearance even when it’s night time. It can even look more beautiful when the sun goes down. 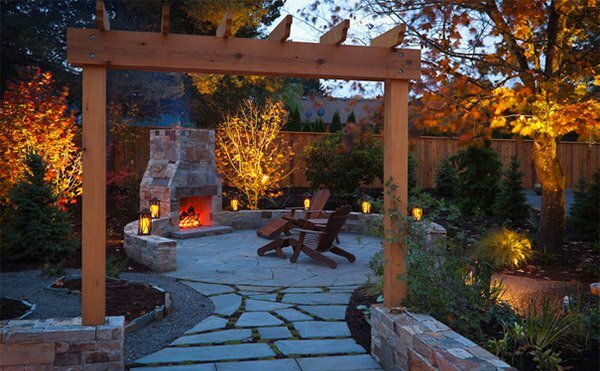 Aside from lights, fireplaces can also be a good way to add life to your outdoor area. 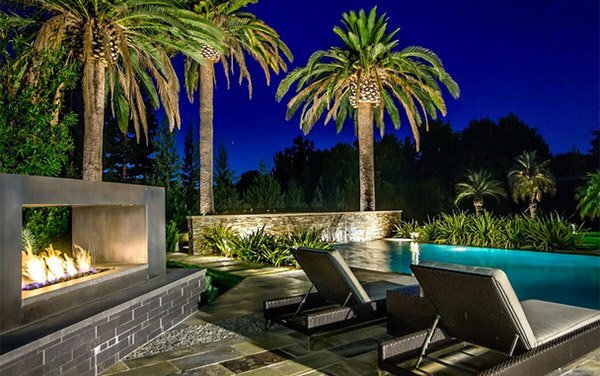 You can look into outdoor stone fireplaces for some inspiration.